Crossovers are the order of the day in the automotive industry. Hyundai knows that at least as well as any other manufacturer in the business, revealing today at the New York Auto Show its seventh and most affordable crossover yet. 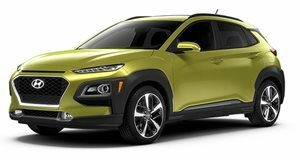 The new Hyundai Venue features a bold design on a small frame to appeal to "urban entrepreneurs,” but doesn't skimp on the features and versatility. It offers a full suite of advanced safety systems and infotainment technologies, and fuel economy projected to come in at 33 miles per gallon (on the combined cycle). The Venue is smaller than the Kona (Hyundai's next smallest crossover) in every dimension but height. It rides on a 99.2-inch wheelbase that's identical to that of the pint-sized Ford EcoSport, and stretches less than an inch longer from bow to stern. Output and performance figures have yet to be announced, but motivation will come in the form of a 1.6-liter naturally aspirated inline-four, mated to either a continuously variable transmission or (good news!) a six-speed manual. Though the manufacturer hasn't said explicitly, it does mention a snow mode for "improved FWD road performance,” suggesting that all-wheel drive will not be on offer. The interior features a 3.5-inch digital instrument display and an 8-inch touchscreen compatible with both Apple CarPlay and Android Auto, with available HERE navigation. And the vehicle can even be started remotely via Amazon Alexa or Google Assistant through Hyundai's Blue Link system. The long list of available safety systems includes forward collision-avoidance, lane-keep assist, blind-spot collision warning, rear collision cross-traffic warning, and driver-attention warning. A dual-level cargo compartment and 60/40 split rear seats make the most of the available cargo room, which comes in at 18.7 cubic feet with the rear seats up and 31.9 with them folded down. 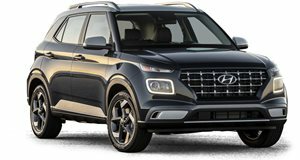 "The Hyundai SUV lineup can be compared with the pieces on a chess board,” said chief designer SangYup Lee. "Our new Palisade is the King, but we are missing the smaller piece. And that’s where Venue comes in. "It may be small, but its unique and bold design sets it apart from the rest of the pack,” said Lee. Buyers will be able to choose between eight exterior colors (with or without a contrasting roof). The cabin comes in either gray or black cloth, but jeans-lovers can order it in indigo-blue with denim upholstery and leatherette with a white roof. The Venue will be built in Ulsan, South Korea, and is set to reach dealers towards the end of this year.